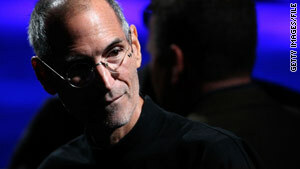 Apple CEO Steve Jobs is expected to unveil a new touch-screen device Wednesday. The state of the union is ... digital. Apple is expected to release a wireless, multimedia touch-screen device Wednesday at an invitation-only event in San Francisco, California, according to blogs and news reports. Apple watchers said the tablet computer will have about a 10-inch screen and will look kind of like an enormous iPhone, but Apple hasn't commented. Steve Jobs helped found the company in 1976, and it changed the world as we knew it with Macintosh computers, iPods and iPhones. Jobs also co-founded Pixar Animation Studios, which made such animated movie blockbusters as "Toy Story" and "Finding Nemo" and merged with the Walt Disney Co. in 2006. In November, Fortune magazine named Jobs its CEO of the Decade. Its profile of him concluded, "After creating more than $150 billion in shareholder wealth, transforming movies, telecom, music, and computing (and profoundly influencing the worlds of retail and design), what should Steve Jobs do next? Given his penchant for secrecy and surprise and his proven brilliance, it's a fair bet that he'll let us know when he's good and ready." When President Obama delivers his State of the Union address Wednesday night, Boynton, an 18-year-old high school senior from Bellaire High School in Texas, will be sitting with first lady Michelle Obama as one of her invited guests, according to the Houston Chronicle. The newspaper reports that Boynton also is expected to hear Wednesday whether or not she is a finalist in the Intel Science Talent Search, the nation's most prestigious high school science honor. The paper said she already has received some $50,000 in college scholarships and has been accepted by Yale University but also has applied to Harvard University. And she told the paper she hopes she can ask the first lady to help her make the choice about schools. "I'm really nervous," she said of her meeting Wednesday night with Mrs. Obama, according to the Chronicle. "I don't know much about politics, and I'm afraid I'll say something stupid. I do that when I'm nervous. And I'm not very coordinated." Four men were charged Tuesday after allegedly attempting to illegally access and manipulate the phone system in a district office of U.S. Sen. Mary Landrieu, D-Louisiana, a local U.S. attorney's office said. James O'Keefe, 25; Joseph Basel, 24; Robert Flanagan, 24; and Stan Dai, 24 -- who allegedly posed as telephone repairmen -- were charged with entering Landrieu's New Orleans office under "false pretenses for the purpose of committing a felony," according to the U.S. attorney's office. Law enforcement officials said O'Keefe is the conservative activist who dressed up as a pimp last summer and visited offices of ACORN, a liberal community organizing group, to solicit advice on setting up a brothel, among other scenarios. He secretly recorded the visits on video and posted them on the Web, leading to a media firestorm. In a recent interview with CampusReform.org, O'Keefe said, "The more bold you are, the more opportunities will be open to you. The less bold you are, the less opportunities in life will be open to you." The billion-dollar stimulus legislation passed by Congress means that Simons has a job today. In November, Vice President Joe Biden visited Phoenix and said that federal stimulus money had saved more than 12,000 jobs in Arizona. Azcapitoltimes.com reported that among those who met with Biden was Simons, a seventh- and eighth-grade teacher who was told her job at the Gateway School was slated for elimination, and that remaining teachers would face unmanageable class sizes of 40 to 50 students. Simons told the vice president that her job was saved by stimulus dollars and because of the funds, class sizes remained at around 30 students. Simons graduated from Arizona State University in 2008 and was accepted in the two-year Teach for America Program, which places teachers in low-income communities. She told CNN on Tuesday that before the stimulus money arrived, it was a difficult period for her. "As a single mother, and pretty much the sole provider for my two children, it was a very stressful time for me, filled with uncertainty. I was getting my resume ready -- and thinking what I would do next," she said. "One of the first things that I thought when my principal indicated that I would lose my job was: How are my kids going to be able to find me? How will I be able to see my seventh-graders become eighth-graders? I can't think of any teacher who says: It's for the great pay. It's the kids who keep pulling you back." On January 27, 1945, Soviet troops entered the Auschwitz-Birkenau concentration camp and liberated more than 7,000 prisoners, most of them ill or near death. Among those who were freed that day, Kor and her twin sister, Miriam, who were to turn 11 soon. Their parents and two older sisters were killed in gas chambers when they first arrived at the camp. Indiana's Tribune-Star in Terre Haute reports the twins escaped death because they were selected by Nazi doctor Joseph Mengele for his terrible medical experiments. Kor has been leading a group of Indiana students and teachers through Auschwitz this week and is participating in official ceremonies commemorating the 65th anniversary of the camp's liberation, according to the Tribune-Star. In December, the metal sign above the death camp's entrance was stolen and recovered a few days later. The famous sign says, "Arbeit Macht Frei" -- "Work Makes You Free." Some 1.1 million people, including at least 1 million Jews, were murdered at Auschwitz. "I want you to remember that in spite of what you see here, the human spirit cannot be defeated," Kor said, according to the newspaper. She added, "In spite of surviving that inhuman cruelty, I have forgiven the Nazis because I deserve to be free from what happened here."